Fig. 3-21. Effect of Sampling Frequency on Image Quality. The three diagrams show illumination patterns having different spatial frequencies present in the scene (left of the arrows) sampled at the same sampling frequency, that is, the same detector array (right of the arrows). The response of the pixels is shown as intensity (gray level) in the three diagrams. From left to right Sampling an illumination pattern with half the spatial frequency. Sampling an illumination pattern with exactly the spatial frequency (the highest possible frequency that can be reconstructed without erroi). Sampling an illumination pattern with twice the spatial frequency, resulting in a pixel response of mid-gray since every pixel Is illuminated over exactly half its area. The spatial sampling process of pixels in an optical instrument is determined by the geometry of the detector elements and by the scanning principles employed for the different sensor types discussed in Table 9-8. The sampling process can introduce errors into the image data if we don't select it properly. The Nyquist frequency is the lowest rate at which information with a given bandwidth must be sampled to avoid errors. Figure 9-21 shows the effect of sampling three different illumination frequencies. The spatial frequency is defined as the inverse of the width of a black-and-white line pair, and is expressed in line pairs per meter. The sampling process is performed in all three cases by the same detector array (right of the arrows), that is, by the same spatial sampling frequency, defined as the inverse of the center distance of the sampling pixels. The maximum spatial frequency which can be reconstructed without error after the sampling/restoration process is defined as the Nyquist frequency, which equals half the sampling frequency, shown in the middle diagram. The response of the detector pixels is shown as intensity (gray level) in the three diagrams. On the left, sampling of an illumination pattern with half die spatial frequency. In the center, sampling of an illumination pattern with exactly the spatial frequency, showing that reconstruction of the original illumination pattern is feasible without error. (However, if the sampling pattern is shifted by half a pixel with respect to the illumination pattern, then reconstruction fails). And on the right, sampling an illumination pattern with twice the spatial frequency results in a pixel response of mid-gray since every detector pixel is illuminated over half its area in the example. All samples in the third case show the same constant value which corresponds to a spatial frequency of zero (line-pairs per meter) which was not present in the original scene. This creation of new frequencies is known as aliasing. Such frequency components cannot be removed by additional processing of the reconstructed image. Furthermore, the well known techniques to eliminate aliasing in electronic signal processing (band limiting the input signal to an electronic sampler using a low pass filter corresponding to the Nyquist condition) are not feasible when we sample images in the spatial domain. Usually we cannot use our optical system as a band-limiting low pass filter since its aperture diameter and cut-off frequency are usually defined by radiometric requirements. The result is that we usually have a certain amount of unavoidable aliasing which degrades the image quality of such systems. The Modulation Transfer Function (MTF) is the ratio of the intensity variation of the ground scene to the intensity variation of the image at a given spatial frequency. The cut-off frequency is that spatial frequency at which the transfer function becomes zero. Figure 9-22 shows the theoretical MTF of an optical system with and without central obscuration. The theoretical MTF can be approximated by a line starting at 1 when the spatial frequency is 0 and falling to 0 at die cut-off frequency, Fc = D/Xh, where D is the aperture diameter, A is the wavelength, and h is the altitude. 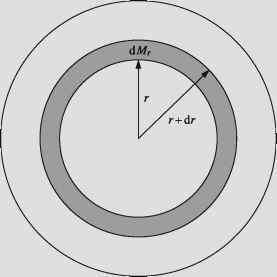 It is the autocorrelation function of the effective aperture. In optical terms, the MTF is tfae absolute value of the complex Optical Transfer Function (OTF) which describes how the complex amplitudes of the optical wave front are transferred by an optical system at different spatial frequencies. 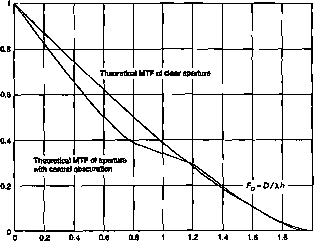 The MTF describes the transfer quality of an optical system as a function of spatial frequency. The point-spread function illustrated in Eg. 9-16 describes exactly tfae same properties by showing the two-dimensional intensity distribution in the focus of the optical system. The two are interrelated by the Fourier transform function. In order to estimate the radiometric performance of optical instruments in the visible or near infrared we start with the radiometric input of the Sun shown in Fig. 9-23.